Nuby Suction Bowl with Lid and Spoon | Red | Makes feeding easy with suction base so that your little one doesn't create a mess. Carry your baby's food in this bowl when out for a trip with your child. 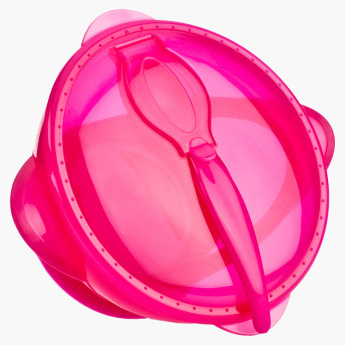 It has a spoon onto the lid and a suction base that makes feeding less messy and hassle-free. Feature 1 : Makes feeding easy with suction base so that your little one doesn't create a mess.